Coinbase, the Andreessen Horowitz-backed Bitcoin wallet and merchant processing platform with just shy of 2 million wallets, is jumping on a big trend in security for holding the crypto-currency. They’re adding multi-signature technology to their vault product, which is designed with long-term, higher net worth holders of Bitcoin in mind. Multi-signature usually means that in order to move or access your holdings, you’d need several keys to sign off on a transaction beyond the individual’s password and platform hosting the wallet. Other rival companies like BitGo were among the first to implement it. In Coinbase’s case, a user will be asked to store a back-up key separately. 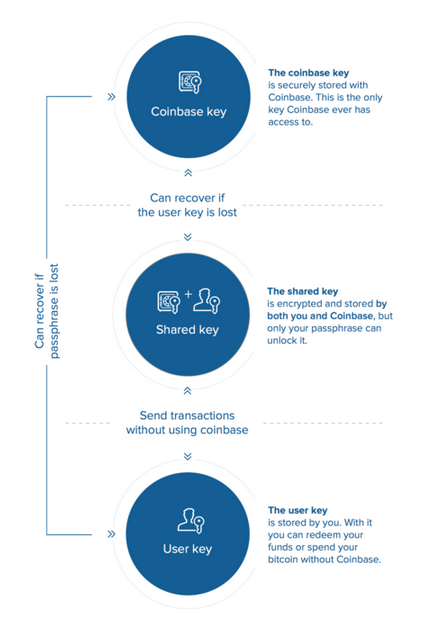 The user will store a shared key that Coinbase encrypts using a person’s password, Coinbase will have its own key and then the user will have a back-up key that they control entirely themselves. Coinbase argues this provides an extra layer of assurance because the company will have no authority or ability to move a user’s funds in case of a security breach. Because the Y Combinator-incubated startup originally wanted to make Bitcoin as simple as Gmail, they had been slower to add more complex features that other rivals like Xapo and BitGo were building to appeal to a base of high-net worth Bitcoin investors. Coinbase’s original wallet has been more geared toward getting the large masses to adopt and transact in Bitcoin. But it turns out that there are many investors that want to hold Bitcoin over the long-term, and don’t necessarily need to use it for day-to-day transactions. That’s partially why Coinbase introduced its free ‘Vault’ product over the summer. In Coinbase’s new vault product, there are more security checks for taking out money and there’s a 48-hour buffer for canceling withdrawals. It’s kind of like your Bitcoin savings account to a checking account, which is Coinbase’s wallet. When you sign up for Vault now, there will be a new option labeled “I will manage security myself” and you’ll have to personally maintain and remember a back-up key. Users can also create group vaults, that require 2 of 3 or 3 of 5 signatures.